This $250 activity tracker has GPS, on-board music storage, and heart rate monitoring, but it's too clunky and difficult to use for daily wear. Activity trackers are getting smaller and more stylish so you can wear them all day every day without your wrist becoming the center of attention. TomTom, maker of popular in-car navigation products, has taken the exact opposite approach with its line of fitness watches. It’s unfortunate because TomTom’s latest band, the $250 Spark cardio and music fitness watch, has some amazing features. But as soon as I strapped the Spark to my wrist, I knew immediately this was not the watch for me. It’s gigantic, even by smartwatch standards. Its strap is rubber, which is tough to adjust to after using the super comfortable Apple Watch fluoroelastomer Sport band. It sits awkwardly on my wrist because it has both a huge display and a touchpad below it. I dislike everything about the way it looks, from its fit to its interface. So I’m pretty mad at TomTom, because the Spark has most of the features I’m looking for in a fitness tracker. At first glance, the Spark is just way too much watch. The Spark is such a beast because it has a whole lot going on: GPS for accurate mileage-tracking, a heart rate sensor, and 3GB of local music storage. Few fitness bands have all three, perhaps because it’s difficult to put them in a presentable package. The MySports app for iOS is basic, but informative (with detailed maps, of course). The watch pairs with TomTom’s MySports app, which is one of the most basic fitness apps I’ve ever used. That’s not necessarily a bad thing. 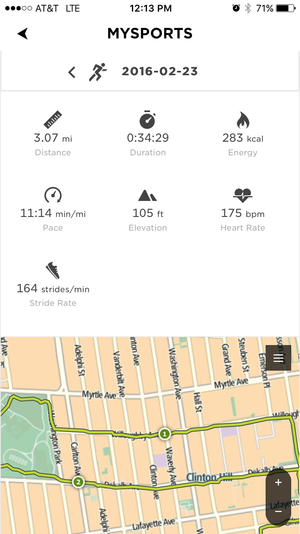 The app grabs data from the device and charts it for you when you sync it with the watch, so you can visualize everything from a map of your route (of course) and elevation to heart rate per mile and strides per minute. There’s no voice coach or training tips, which TomTom should consider adding to make MySports more competitive with other activity-tracking apps. You can track basically any workout that gets your heart rate up, including running, swimming (the watch is waterproof up to 40 meters/130 feet), cycling, treadmill work, or indoor workouts like weightlifting. It also counts steps, like any other run-of-the-mill activity tracker. The Spark will even track your sleep, though I have no idea who would wear this behemoth to bed. The Spark isn’t focused on step-counting and sleep-tracking, though it can do those things. 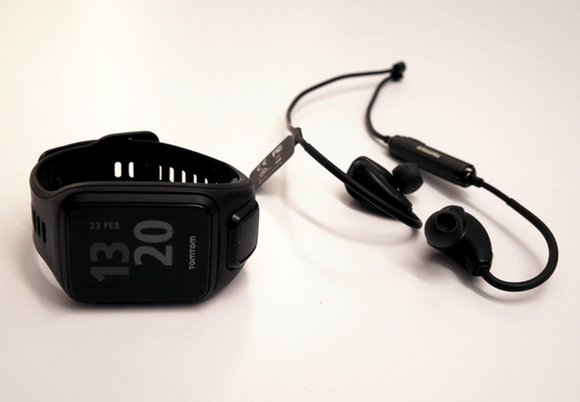 This watch is for tracking workouts—and the more intense, the better. Inside the watch is a motion sensor (a combination accelerometer and gyroscope), a compass, and an optical heart rate sensor, like the one on the Fitbit and Apple Watch. Heart rate tracking on the wrist used to be unreliable, but it’s improved by leaps and bounds in recent years. I tested the Spark against my Polar H7 heart rate monitoring chest strap and found the watch to be within two beats of the strap’s count throughout the bulk of my run, though wildly off at warm-up and cooldown. But plenty of fitness trackers track heart rate accurately now. Where the Spark differentiates itself is with its on-board music storage, which in combination with GPS and heart rate monitoring makes this watch truly unique. With 3GB of space, you can store up to 500 of your most motivational workout tracks on the watch itself, then play them using Bluetooth headphones. You can tack a pair of TomTom headphones onto your Spark order for an extra $25. 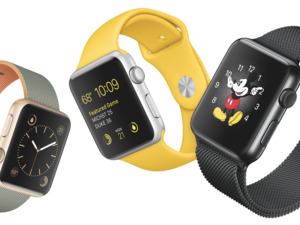 You can store up to 500 songs on the watch and play them back with Bluetooth headphones. It’s too bad getting the songs onto the watch is such a pain, because I might be able to overlook the hardware design if actually using the watch was easier. You have to install the TomTom MySports client on your desktop (not your phone), then connect the watch to its USB cable (not an easy feat in itself), plug it in to your desktop, then scan your computer for music. You better have your playlists created, named, and ready to transfer, because the app won’t let you import individual songs or specific albums. Just playlists. You can’t even open the playlist in the app to make sure it’s the right one, nor can you open a playlist on the watch—all you can do is press play. I transferred my “25 Most Recently Played Songs” playlist from iTunes and had no idea what was on it (though I should’ve guessed it was mostly Beyoncé). 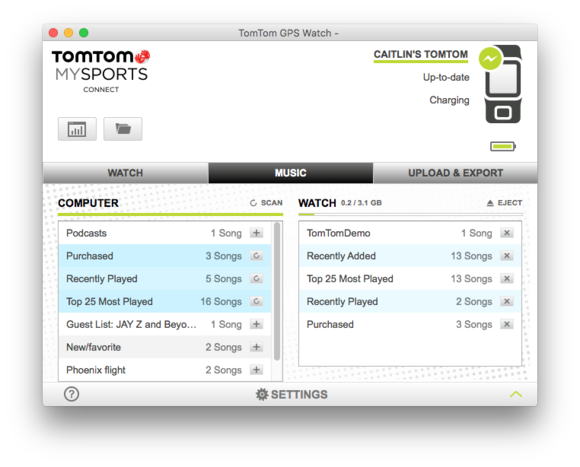 The TomTom MySports Mac app doesn’t make it easy to transfer music onto the watch. If you prefer to stream music instead of buy it, you’re out of luck here. The Spark doesn’t have streaming music service integration. The Apple Watch wins major points in this category, because it lets me save Apple Music playlists offline and transfer them to the watch without buying a single song. The Spark also falls short with its navigation, which is touchpad-based instead of a touchscreen. It’s bizarre, because this thing has a giant display, and I keep wanting to tap on it, but instead you have to press up, down, left, and right on the touchpad below the screen to move around. TomTom told me this method is easier to use than a touchscreen when working out, but in my experience, that’s not true. When I’m running, the last thing I want to do is grab my wrist to stabilize it, then press down hard on a button to navigate back to the music screen or check my heart rate. Fitness bands, smartwatches, and activity trackers, no matter what features they have, need to fit into your life to be useful. I would wear the Spark to work out, but there’s no way I would wear it as part of my daily routine. The Spark doesn’t look nearly as gargantuan on dudes as on me, a woman with small wrists. Despite being the kind of person who would regularly wear a device like this, I feel like I’m not in TomTom’s target market for this product—and offering Spark bands in small and large doesn’t cut it. I’m not asking for Swarovski crystals or pink watch straps. If I’m going to spend $250, I want a thoughtfully-designed watch that I can wear on a run, to the office, and out for dinner. The Apple Watch achieved that. I think TomTom can, too. 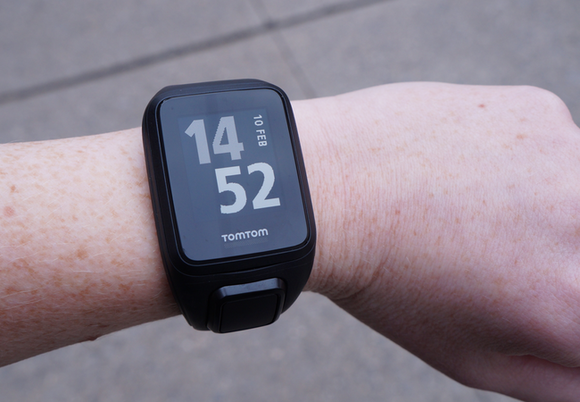 TomTom put GPS, heart rate monitoring, and 3GB of on-board music storage in one clunky fitness watch.